Gary Bert "Bones" Bromley is a former ice hockey goaltender. He played in the National Hockey League with the Buffalo Sabres and Vancouver Canucks. He also played in the World Hockey Association with the Calgary Cowboys and Winnipeg Jets. 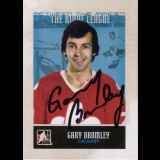 In his NHL career, Bromley played in 136 games and accumulated a record of 54-44-28. In the WHA, he played in 67 games, with a record of 31-21-3. He may be best remembered for his "Skull" mask which he wore during his years with the Canucks. The idea for the design came from his nickname, "Bones". New Response (Success): 3 4 x 6 photos and asked him to keep some if he wa..